Field certification of CEMS below 1 ppm NOx. An earlier presentation after eighteen months of operation was made by the authors at the Air and Waste Management Association national conference in San Diego, California, June 24, 2003. For a tour of the UCSD central plants installation, or for a printed copy or CD of this release, please contact John Prince at (714) 968-5501 or by email . Copyright 2003-2008 APG Analyzer Systems. All Rights Reserved. The cogeneration plant at the University of California, San Diego, (UCSD) generates 25 megawatts of electricity and enough steam for the campus. The campus specified a non-ammonia type system to achieve the 2.5ppm NOx emissions requirement in order to maintain its status as a synthetic minor source designation and allow for future campus expansion. A chronological account of the past 48 months of successful continuous monitoring of NOX levels of 0.1 to 2.1 ppm is presented. Included is on-site field experiences of the authors during the installation, start-up and commissioning of the CalCEMS(tm) emission monitoring system currently in use at the University of California, San Diego campus (UCSD). Results of the pre-certification testing by San Diego Air Pollution Control District (SDAPCD) are presented along with discussion of stratification issues, relative accuracy test audit results, up-time of the CalCEMS and ongoing operation and maintenance requirements. A brief discussion of any unexpected on-site field experiences during the installation, start-up, commissioning, certification and operation will be presented. Field modifications and unscheduled service will be discussed. This report is directed toward operators of combustion processes where the expected NOx emissions concentration is expected to be below 5 ppm and air pollution agencies responsible for ensuring accurate emissions testing. Presented are results of a "real world" stack monitoring system as documented over a forty-eight month period of successful monitoring. Data was collected in a field environment from stacks with high levels of stratification. Daily NOx concentrations ranged from 0.1 to 2.1 ppm with 40-50% present as NO2. The on-site field experiences of the authors during the installation, start-up and commissioning of the CalCEMS emission monitoring system currently in use at the University of California, San Diego campus (UCSD) will be presented. The successful certification of the CalCEMS by personnel from the San Diego Air Pollution Control District will be discussed. A summary of daily operation, maintenance requirements and comprehensive and detailed service history of the CalCEMS over the past forty-eight months will be presented. UCSD is an educational and research campus with approximately six million square feet of occupied space within 60 buildings. With a campus population of 20,000 students and 10,000 staff and faculty, the annual load is approximately 200,000mW-hr with a maximum demand of 27mW. Approx 3.5 million square feet is conditioned with high temperature and chilled water generated via steam produced from the waste heat of gas turbine exhaust. The system currently has over 10,000 hours of operations. System availability has been 90% for the past year. The combination of the Solar Titan So-Lo NOx combustion technology with the ScoNOx post-combustion treatment has consistently produced results in the .5 - 1.5ppm range. Total NOx produced for the previous 12 months was 3.5 tons with 190,000mWhrs produced. SoLoNOx is a trademark of Solar Turbines, Inc.
SLC 5/05 is a trademark of Rockwell Automation, Inc.
UCSD's cogeneration plant generates 25 megawatts of electricity and enough steam for the campus. Use of Solar Turbines' SoLoNOx(tm) turbine generators and state-of-the-art SCONOx(tm) air emissions control technology have resulted in oxides of nitrogen (NOx) emissions with daily averages of 0.1 to 2.1 ppm parts per million by volume, the lowest emission rate for cogeneration in the San Diego Air Pollution Control District. Figure 1. UCSD Central Utilities. John Dilliott remotely monitoring NOx emissions. Commissioned in 2001 with a state-of-the-art pollution control system, the innovative cogeneration facility located on the University of California campus in San Diego is the primary provider of electrical and steam power to the UCSD campus community. By running the cogeneration plant, which provides nearly all of UCSD's daily electrical needs, steam is produced that would otherwise be generated by older boilers, which emit more pollution. The state-of-the-art system was installed to reduce the nitrogen oxide emissions, the pollutant that forms smog, to 50 percent of the required levels set by the San Diego Air Pollution Control District. The SCONOx emissions control system utilized by the UCSD cogeneration plant is one of the first commercial installations of the new, cutting edge technology. Detailed specifications and nameplate data for components of the UCSD cogeneration facility are presented in Appendix A. The CalCEMS Continuous Emissions Monitoring Systems is a stand-alone automatically-operated emissions monitoring system with all the components required for successful monitoring of NOX emissions less than 5 ppm. John Prince performing routine checks. The probe consists of one dry multi-point probe with heated filter element mounted on the stack. A specially designed heated sample umbilical bundle is used for transporting the sample from the probe filter to the cabinet. Temperature of the bundle is carefully controlled from the main cabinet. The system is controlled by an Allen-Bradley SLC 5/05 programmable logic controller (PLC) which automatically introduces calibration gases on a regular basis. Calibration calculations, probe blowback and switching of the two sample gas streams are controlled by the PLC. Detailed description of how the CalCEMS was able to use a specially-designed stream-sequencing assembly to monitor two stacks with one set of analyzers will be presented in a subsequent publication. The analyzers are located in the main cabinet with the main sample conditioning system which consists of switching valves, a condensation removal assembly and filters specifically designed by APG Analyzer Systems for very low NOx levels. Also in the cabinet are the sample pumps, flow controls and indicators. The cabinet is located in an air-conditioned 6-ft x 8-ft enclosure. Both dry-basis and wet-basis gas analyzers from various manufacturers can be installed in the CalCEMS. Analyzers used in the UCSD installation utilized the chemiluminescence method of measurement for NOx and paramagnetic for oxygen. Detailed specifications are presented in Appendix B. A discussion of on-site field experiences from the initial installation, start-up, commissioning and certification, through the first 48 months of continuous operation will be presented. Results of the comparison of the test lab results with those of the CalCEMS using a standard single-point probe are presented in Figure 3. This data indicated a response time of the CalCEMS of 2-3 minutes. This CalCEMS was a time-shared system, "time zero" is the point at which the sequencer switched from one stream to the stream being tested by SDAPCD. Typical response time for low NOx monitoring is 2-3 minutes. positioned at the tip of the CalCEMS probe. Testing prior to the first certification by the San Diego Air Pollution Control District (SDAPCD) revealed a high degree of stratification in each of the emissions stacks. An approximation of the stratification pattern is presented in Figure 4. Subsequent to learning the test results, the standard dry probe was replaced with one having multiple openings along the shaft. No special balancing or mixing device was installed. Daily NOx averages from December 2001 through May 2003 ranged from 0.1 to 2.1 ppm NOx. Data collected during the most recent twelve month period is presented in Figure 5. Relative Accuracy Test Audits were conducted annually, the first being performed in December 2001 and the second the following year, in December 2002. The results are summarized in Table 2. Figure 6. San Diego APCD test team. On site at UCSD performing RATA testing on south stack. Figure 7. San Diego SDAPCD mobile stack test lab. The field challenges were determined to be a result of two factors: stratification of NOx in the stacks, and temperature effects. Upon initial installation, the San Diego Air Pollution Control District (SDAPCD) performed an initial relative accuracy test audit. This audit revealed a high degree of stratification in both stacks (Figure 4). The original installation included a single-point dry type probe with a heated filter mounted on a flange at the stack. NOx concentrations across the stack were found to be stratified and also changing the concentration pattern with time. To resolve this problem, the single-point probe was removed and replaced with a single-tube multi-point probe. Additional ports were made into the stack until a the CalCEMS output indicated that a representative concentration had been reached, as compared with the SDAPCD manual test results. The multi-point probe was installed and remains in use at this time. Once the new probe was installed, the CalCEMS was certified by the SDAPCD in December 2001, and again in December 2002, at 0.8 ppm NOx. Originally the CalCEMS cabinet had been installed in a location where the ambient temperature fluctuated from 70-110 degrees. Although this was a convenient location for operation and service, it was noticed that temperature effects on the NOx output were greatly at these low NOx levels. To overcome this, the CalCEMS was relocated to a small six by eight foot shelter and placed outside the cogen. A window air conditioner and small electric heater were sufficient to ensure a stable ambient temperature in the shelter. Visual checks were performed on a regular basis, a least once per week, unless outputs or caution relay outputs indicated that service or re-calibration was required. A check list was completed each time and left with the CalCEMS as an ongoing record of operation. Regular checks included visual checks of sample and bypass flow rates, pump inlet pressure, pump outlet pressure, NOx pump vacuum, temperature of heated sample conditioning assembly, temperature of heated lines, ambient temperature of shelter (max/min). Also a visual check was made to ensure that the condensate pump was rotating and that the bypass pump was operating. The oxygen analyzer required re-calibration only when power was disconnected or service was performed. Over the past forty-eight months, the NOx analyzer was calibrated manually once every 4-6 weeks whenever the span drift began to approach the maximum limit as defined by SDAPCD. During the first forty-eight months of operation, no special maintenance procedures were required and no unscheduled periods were encountered during which the CalCEMS was out of service. Filter elements and seals throughout the system were replaced as needed. This was found to be typically once every 4-8 months for expendable items within the NOx analyzer. For the sample system and other parts of the CalCEMS, replacement of filter element and elastomers was once every 6-9 months. When the span pot on the NOx analyzer approached its full adjustment limit, the reaction cell was removed and cleaned, elastomers replaced and reassembled. The analyzer was then calibrated manually and returned to service. Once the technician became familiar with servicing the analyzer, this procedure required 1-2 hours or less and was performed once every 4-8 months as needed. Calibration gases were replaced as they were depleted. With regards to unscheduled maintenance and repair, a heating element in one of the sample conditioning enclosures exhibited a failure rate of four times during the first year of operation. This problem was resolved when a more stable element was installed. This element failure did not result in the shut down of the CalCEMS or the loss of any data. No other unscheduled service or maintenance was required during the first forty-eight months of operation. Initially the calibration gas usage was higher than desired. To reduce this, a low-flow calibration gas assembly was installed and the PLC program modified. With this modification, calibration gas usage dropped by 60%. An additional change was made to the PLC program to allow the operator to manually bypass sampling one stack at any time desired without affecting the automatic operation of the CalCEMS. This was required because of the fact that when one of the boilers is started up, there is a change in the stack emissions which was causing the probe filter element to become fouled. This bypass can be made using a toggle switch at the CalCEMS cabinet or remotely via Ethernet from the control room. (1) "UCSD Cogeneration Plant Experience with Ultra Low Emissions Control," presentation by John Dilliott PE, Plant Manager, UCSD Central Utilities, Air and Waste Management Association, San Diego Section, November 18, 2002. (3) "Develop Source Test Method for Low NOx Levels (<20ppm)," South Coast Air Quality Management District Board Meeting, Agenda No. 35, Section G-1, June 7, 2002. (4) "NOx Emissions Lowest in the US at UCSD Cogen," Instrument Society of America, Southern California Sections Newsletter, May 2002. (5) Chart of daily average NOx data supplied by UCSD Central Utilities for the period April 1, 2002, through May 12, 2003. (6) "UCSD CalCEMS Performance," table showing percent up-time for continuous emissions monitoring system from first quarter 2002 through first quarter 2003. (8) CalDAS(tm) data acquisition system and CalCEMS Anywhere! (tm) remote troubleshooting and monitoring capabilities are not a part of this installation at the time of publication. As more efficient emissions control technologies are developed, EPA and the Air Pollution Control Districts are continually investigating their use and developing reliable methods of accurately measuring these low levels of NOx. Mohsen Nazemi, Assistant Deputy Executive Officer of Engineering & Compliance presented this item on the various options for controlling NOx emissions from power plants including turbines, internal combustion engines (ICEs) and boilers. This item was requested by Board member Cynthia Verdugo-Peralta and has been carried over from the October and November meetings. Mr. Nazemi explained that controls are typically installed as a result of modification of existing units, repowering of existing units and for new projects (central and distributed generation). NOx emissions are created in two ways: by the presence of nitrogen in the fuel (fuel NOx); and by the burning of fuel (thermal NOx). There are several pre-combustion and post combustion control technologies available for controlling NOx. Pre-combustion methods include fuel/feed modification such as ultra low nitrogen fuel and excess air combustion; temperature absorption such as flue gas recirculation and water/steam injection, and combustion staging/modification such as overfire air, ultra-low NOx burners and catalytic combustion (e.g. XONON cool air combustion). XONON was certified by the ARB in June 2002 (at 2.5 ppmvd NOx and 6 ppmvd CO) and is presently installed and operated in a 1.5 MW turbine with two other installations proposed. Post-combustion technologies include Selective Non-Catalytic Reduction (SNCR) and catalytic reduction such as Selective (SCR) and non-selective (NSCR) catalytic reduction. SCR and SNCR require the use of ammonia or urea while NSCR does not require ammonia or urea. SCR can achieve 80 - 95+ % reduction in NOx while SNCR can achieve from 40 to 70% NOx reduction. NSCR, on the other hand, can achieve an 80 - 95% NOx reduction. One example of NSCR is the three-way catalyst used to reduce NOx, CO and VOCs in rich burn ICEs. Another one is SCONOx which involves absorption and oxidation of NOx through a catalyst. SCONOx can also reduce CO and VOCs at the same time. ARB certified SCONOx (at 2 ppmvd NOx, 15% 02, and three-hour averaging) in November 1998. AQMD is presently processing a permit for a power plant (Malburg in Vernon) where emission limits are 2 ppm for NOx and CO and 1.2 ppm for VOC with 5 ppm NH3 slip. The project is proposing to use SCR and oxidation catalyst to achieve this BACT emission level. SCR is a mature technology and has been used and proposed in hundreds of installation while SCONOx is installed and operating in nine facilities with a few others proposed. Based on AQMD and other source information, SCONOx and XONON have higher capital costs than SCR. However, the SCONOx manufacturer has claimed that the life cycle cost of SCR is equivalent or greater than the cost of SCONOx. One area of concern for SCRs is the use of ammonia which is an acutely hazardous material and a precursor to PM10. The total ammonia inventory in the SCAQMD is 185 TPD based on the 2000 AQMP. Industrial sources are 7% of this or 13 TPD. The percentage of the industrial source total contributed by NOx control is 5% of the 13 TPD, or 0.65 TPD. By 2004, it is expected that if all existing and proposed projects install SCR and all projects have a 10 ppm ammonia slip, ammonia from NOx control will increase to 14% of the industrial source inventory or 2 TPD. This amount will be about 1% of the total ammonia inventory in the Basin. Ms. Verdugo-Peralta raised concerns about the transport and emission of ammonia and its impacts on AQMD environmental justice initiatives. Mr. Nazemi indicated that for all of these projects, only aqueous ammonia is allowed to be used and has to be transported in the aqueous form. Ammonia emissions impact on the environment is reviewed during the CEQA analysis. The ammonia slip is limited to 5 ppm and is required to be monitored through permit conditions. There are also new direct ammonia continuous emission monitoring systems (CEMS) that may be required once they are certified. Toxic risk analysis and/or modeling is also conducted for any ammonia slip during normal operation as part of permit evaluation. The Ambient Monitoring, Source Testing, and Laboratory Analysis sections of the [South Coast Air Quality Management District] provide technical support in measuring and monitoring ambient air pollutants. The AQMD relies on U.S. EPA Reference Test Methods to conduct analysis of ambient and source test samples. At times, new test methods are developed to address specific sampling or measurement needs. The AQMD has had several methods approved by the U.S. EPA and other groups conducting ambient measurements are using these methods. As ambient pollutant levels are lowered, there is a need to develop or enhance current sampling/laboratory analysis methods to detect lower concentration levels. The initial presentation about this system after the first eighteen months of operation was made by the authors at the Air and Waste Management Association national conference in San Diego, California, June 24, 2003. For a tour of the UCSD central plants installation, or for a printed copy or CD of this release, please contact John Prince (714) 968-5501 or by email. 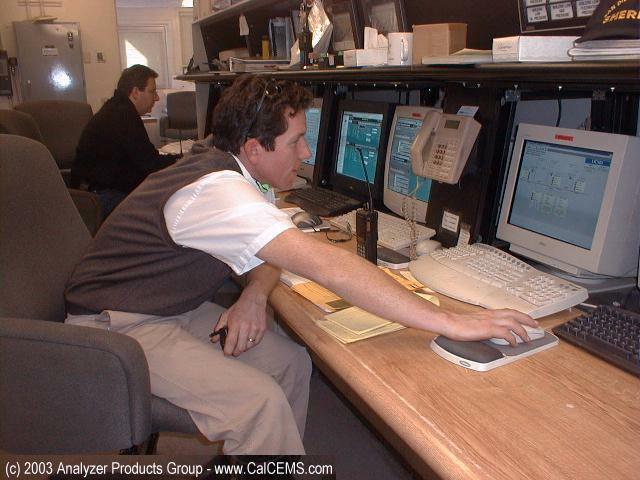 Copyright (C) 2003-2006 APG Analyzer Systems. All Rights Reserved.